Issues One-Year Report on Open NY Transparency Initiative Encourages New Yorkers to Engage with Open Data Online at Data.NY.Gov. Albany, NY - March 18, 2014 - Governor Andrew M. Cuomo today honored Sunshine Week by issuing a one-year report on Open NY, an initiative aimed at increasing citizens' engagement with their government, and encouraging New Yorkers to visit the State's comprehensive data transparency website, Data.NY.Gov. The Open NY One-Year Report, which reviews accomplishments and sets the stage for the future of the initiative, is available on Data.NY.Gov. The ultimate goal of the Open NY initiative is to increase public trust by leveraging the collective genius of our citizenry to increase transparency and improve government performance. The Governor signed Executive Order 95 last March, which recognized that government’s responsibility to provide information to the public through affirmative disclosure has changed in the digital age. The order required for the first time that New York State agencies continually review and catalogue their data for publication in an open format online. It further required the State to create and maintain a website that provides, organizes, and makes searchable open data. That website, Data.NY.Gov, had more information than any other state data site at launch, including over 200 datasets, maps, and charts from over 30 state agencies and authorities. Top baby names in New York since 2007, filtered by year, gender, and count. The Office of Information Technology Services (ITS) maintains and continually enhances Data.NY.Gov, aiming to usher in a new era of open collaboration and public participation in state government. This week it will introduce a new developer resource, a library of guidance materials including code samples, to facilitate the creation of successful mobile apps like the I Love NY smartphone app, which provides geographically-targeted tourism, recreation, lodging, and dining options in every region of the state. Further, New York became the first state to publish provisional open data guidelines and seek public comment on GitHub, which allows easier use of and access to data for research purposes and app development. The Open Data Handbook, available here, provides guidelines to government entities participating in Data.NY.Gov for identifying, reviewing, and prioritizing publishable data. ITS, in partnership with the Center for Technology in Government (CTG) at the University at Albany, SUNY, will host a collaborative workshop called Shaping Open NY: Visioning a New Transparency Hub today, March 18, to elicit strategies to take Open NY to the next level. The State will launch a new hub in the near future, incorporating the best strategies culled from the workshop. 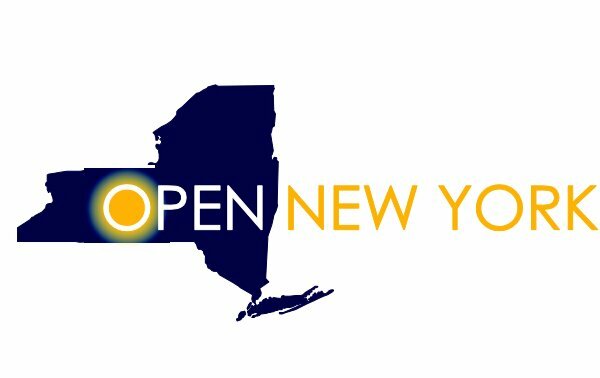 ITS’s Open NY team is led by top experts in transparency and technology, including Director Andrew Nicklin and advisors Dr. James Hendler of Rensselaer Polytechnic Institute and Dr. Theresa Pardo of CTG and the University at Albany. The team coordinates with the Executive Chamber through Rachel Haot, Deputy Secretary for Technology, who leads the State’s digital strategy across web, mobile, and social media with a focus on streamlining services and supporting public engagement. The remarkable growth of Open NY builds on the work to make government more transparent through technology. Examples are the creation of the CitizenConnects website to serve as an “online town hall” where New Yorkers can find the Governor's past schedules and information about meetings around the State and watch video of the Governor’s events. The Tappan Zee Bridge website provides access to all prior project reports along with up-to-date construction information. TheNewNY.com website provides information on starting and maintaining a business in New York State and the Regional Councils website provides detailed information on economic development projects. These new uses of technology build on steps taken by the Governor to open the doors of government to New Yorkers, which included, as his first act in office, opening the Capitol’s second floor to the public for the first time in more than a decade, inviting the public for the first time to attend the State of the State address, and deploying the Governor’s Cabinet and deputies across the state to communicate with New Yorkers through public forums. In addition, the Governor, together with the Legislature, passed ethics reform in 2011 that created the Joint Commission on Public Ethics and increased disclosure requirements for public officials. Ben Balter, Government Evangelist at Github said, "Using GitHub to collaborate with software developers in drafting the Open Data Handbook is a great example of the innovative thinking within New York State government. As technology allows us to reimagine the relationship between citizens and a 21st century government, Open NY is at the forefront." Subject: LongIsland.com - Your Name sent you Article details of "Governor Cuomo Highlights Open NY for Sunshine Week"